Hard drives locked with ATA passwords can be a big problem for data recovery technicians and forensic specialists. When a hard drive is locked with an ATA password, there is no way to gain access to the drive without the password and there is no way to crack the password using "brute force" style methods. 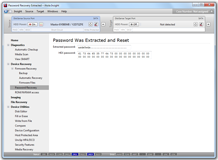 The Atola Insight's automatic password removal function is able to extract the original password from the hard drive's firmware area and unlock it in under 2 minutes with just a few mouse clicks. Note: Unlocking the hard drive does not affect hash values because the password is stored in the hard drive's firmware area (which is never included in hash calculation by any forensic product). The Atola Insight automatically checks the hard drive's security status when the drive is first initialized at the beginning of a case. The security status is displayed on the main screen for the operator's convenience. The operator can also re-check the status with a click of a button. 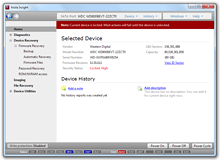 If a drive is locked with an ATA password, the operator can choose to unlock the drive or just extract and view the password without unlocking the drive. This entire process takes under 2 minutes and works for both High and Max security levels. Extracting the password and unlocking the hard drive has no impact on MD5 or SHA hash values because passwords are stored in the hard drive's firmware. 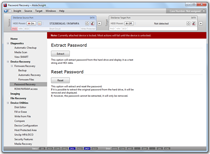 After the password removal function is initiated, the password is extracted in less than 2 minutes. The password security level (High or Maximum) does not impact the procedure in any way. The password will be listed in both HEX and alphabetical form. Like all Atola Insight functions, this entire process is automatically logged in the Case Management system. How do hard drives become locked with ATA passwords? 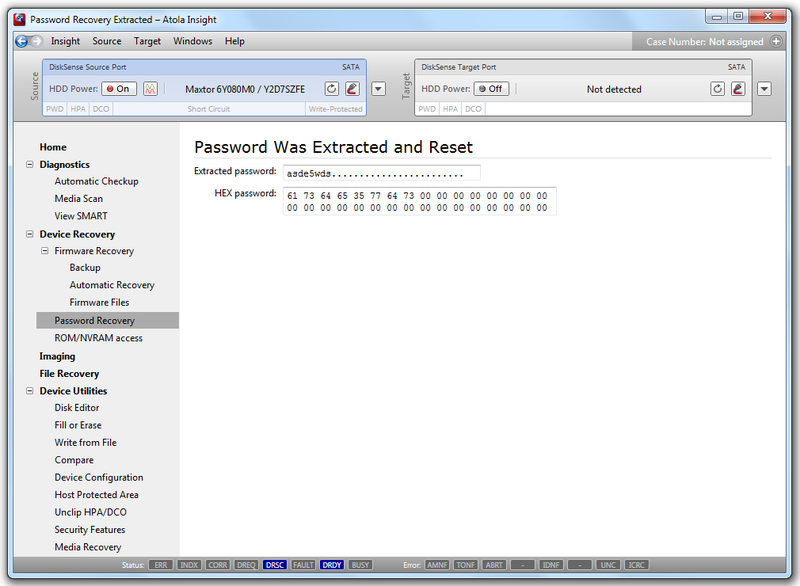 ATA passwords can be set through the computer’s BIOS or using special products like the Atola Insight. Freeware tools are available as well. Does this function remove BIOS passwords? No. BIOS passwords are a different form of security that does not have to do directly with hard drive programming or the ATA standard (although, depending on the specific computer, an ATA password might be set by the BIOS when defining a BIOS password). What hard drives are supported? Automatic password removal works for most hard drives available on the market. For more specific information, please refer to the Supported Drives List.